Teen dating violence (TDV) is defined as a pattern of abuse or threat of abuse against teenage dating partners, occurring in different forms, including verbal, emotional, physical, sexual and digital. 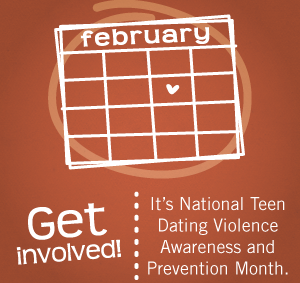 Every year, approximately 1.5 million high school students nationwide experience physical abuse from a dating partner. It is also known that 3 in 4 parents have never talked to their children about domestic violence. In light of these alarming facts, every year during the month of February advocates join efforts to raise awareness about dating violence, highlight promising practices, and encourage communities to get involved. Leaving a violent relationship is easy. Violence often starts later in the relationship which can make it harder for the victim to leave it. In most cases, violence tends to escalate over time when the abuser starts to believe that they have all of the power and control in the relationship. Fear, financial dependency, low self-esteem, or hope that the abuser will change are some of the many reasons why it may be difficult for the victim to leave that relationship. Violent relationships only consist of physical violence. Violence is much more than just physical. Other forms of violence can consist of verbal, emotional, financial and sexual. The abuser only acts that way out of love. Sometimes love is used as an excuse for violent behaviors in a relationship. You would often hear from the abuser “I did this because I love you,” “I reacted that way because I care about you so much,” or “If I can’t have you, nobody can.” Saying that you love someone or care about someone is not an excuse for violent behavior. It must have been the victim’s fault. It is important to know that violence is not something that is provoked by the victim. The abuser usually looks to find any excuse to get upset or become violent. Regardless if the victim has an excellent behavior or not, the abuser will look for a reason to be violent towards their partner. Instead of focusing on how the victim can avoid provoking the abuser, it is best to focus on ways the victim can safely get out of that abusive relationship. Their dating partner is extremely jealous. They are insulted, humiliated or put down by partner. If they have ever been frightened or physically harmed by partner. Their partner makes all the decisions in the relationship. Their partner controls their behavior. Their partner checks up on them, calls more often than usual, shows up unexpectedly or demands to know how all time apart is spent. If you or someone you care about is involved in an abusive relationship, please seek the help you need. Reach out to someone you trust, or call the National Domestic Violence Hotline at (800) 799-7233. ← 2…4…6…8?!? We’re Expanding our Team (again)!